One year ago, familiar images flooded television screens across the country. They confronted their lawmakers. They rallied others to their cause. 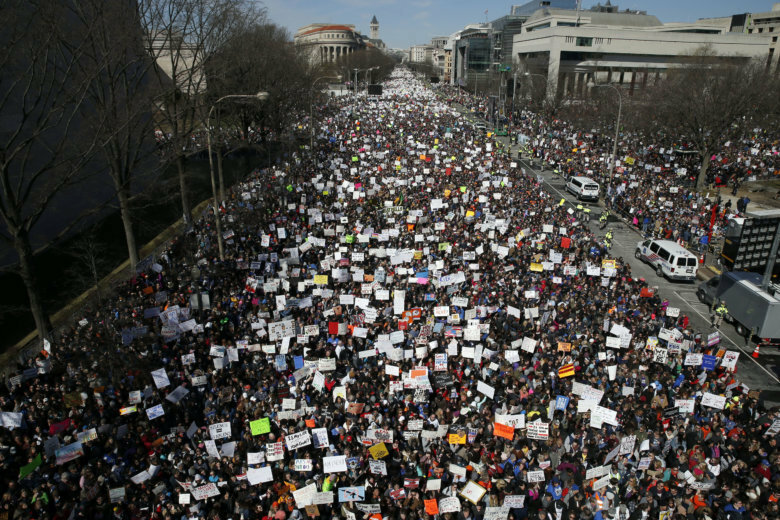 And then they took to the streets of D.C. to put on the March For Our Lives, make pleas for reform. (CNN) — One year ago, familiar images flooded television screens across the country. When contacted by CNN, a spokeswoman for the National Rifle Association touted its own success. By the NRA’s count, 203 “anti-gun” bills failed or were defeated in 2018, and 7 more were vetoed by governors. The NRA said that 26 pro-gun laws were enacted at the state level in 2018. For years, gun violence prevention advocates worked to lay a foundation for gun control policies by building an infrastructure and introducing bills, even if they were going to fail, Anderman said, and that helped the “tremendous success” advocates saw in 2018. Advocates for gun safety legislation say that one of the clearest indicators that 2018 was a watershed moment was that the bills weren’t limited to Democratic legislatures and governors. It took less than a month after the Parkland shooting for Florida’s Republican legislature to pass SB 7026 and send it to the desk of then-Gov. Rick Scott. The bill, also known as the Marjory Stoneman Douglas High School Public Safety Act, covered a wide range of policies. Some of them were championed by gun control advocates, like allowing law enforcement to ask for an “extreme risk protection order,” which temporarily prohibits someone from possessing firearms if they pose a threat to themselves or others. But SB 7026 also provided additional funding for armed school resource officers and cleared the way for armed teachers, as long as the local school district and sheriff’s department are in agreement. Those approaches aren’t favored by many gun control advocates and weren’t championed by most of the Parkland students. But they were supported by Andrew Pollack, whose daughter Meadow, a senior at Marjory Stoneman Douglas High School, was killed. In the year since her death, he’s worked to make school safety a priority in Florida and met with President Donald Trump. Now, he’s a member of the Florida Board of Education, where he hopes to make change happen from the inside. “I thought that if we were truly being intellectually honest and wanting to address the issue comprehensively, all components needed to be a part of it,” said Galvano, who sponsored the bill. But, Galvano said, “Parkland very clearly reminded us that we had to do so much more, that what we had done in the past was not enough. But it wasn’t just state legislators who passed new gun control measures. Voters in Washington state took matters into their own hands and passed Initiative 1639, the only voter initiative aimed at gun safety that appeared on a ballot last November. “That was an even bigger disappointment when the legislature failed to take action after Marjory Stoneman Douglas,” he said. But that changed when nearly 60% of voters passed I-1639, under which gun owners could be held criminally liable if someone who’s not allowed to access a firearm, like a child or a felon, uses it in a crime — unless the gun owner was found to keep the gun secured in a safe or lockbox. For example, both Idaho and Wyoming enacted “Stand Your Ground” laws, which allow the use of deadly force in response to threats without the fear of criminal prosecution. Oklahoma expanded its “Stand Your Ground” law to allow deadly force in houses of worship, and Wyoming also repealed the prohibition of guns in houses of worship. “I think we moved the needle. Not enough, but we did,” Jaclyn Corin, one of the founding members of March For Our Lives and a senior at Marjory Stoneman Douglas, told CNN’s Dianne Gallagher of the initial rush of activism that came out of the Parkland shooting. But there’s always more room to make change, she said. And so the students who put on the March For Our Lives focused their energy on encouraging young people to vote for candidates whose policies aligned with theirs. They toured the country, meeting and talking with local activists to build a decentralized coalition to tackle gun violence in their communities. “We are actively creating a grassroots army of young people that are focused not only on Congress, but on their state legislatures, on their city councils and school boards because that’s where the real work gets done,” Corin said.